Hiking happiness has been on my mind this month, mostly because the world seems so turbulent and unsettled - a stark contrast with how I feel when I hit the trail. I think we can all agree that hiking is the perfect antidote to stress and chaos. 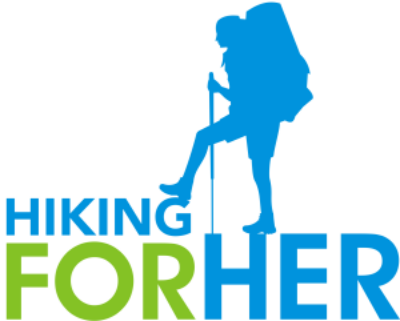 And that's why Hiking For Her exists: to continually share tips for happy trails, whether on the website or right here in this newsletter. Let's start off this month with a happiness inducing re-design of the beloved hiking and camping utensil, the spork! You might think it's a stretch to connect a new spork with hiking happiness, but only if yours has never snapped in two just as you took that first mouthful of noodle soup after a long, long day of hiking. This redesigned spork is crazy long, with a rubberized edge. It's been dubbed "the morsel spork". The video (link below), explaining how much engineering and thought has gone into the effort, is weirdly entertaining. And just for the record: I have no affiliation with this kickstarter project, just wanted to share it with you as you're double checking your gear lists for upcoming hiking trips. Of course, if donating to such engineering feats gives you hiking happiness, so much the better! It's a fact that a safe hiker is more likely to claim hiking happiness as the reward of a great hike. As a Hiking For Her insider, you have access to a monthly giveaway which is hidden from the website readers. To increase your chances of winning, my dear! If you haven't entered to win the possum down (yes, possum down) gloves yet, you still have a few more days until March goes out like a possum/lamb. A winner will be announced on April 2, so if you happen to get an email on that day with the subject line Hiking For Her Winner, these uniquely warm and soft hiking gloves ($45 US value) are all yours. In the color and size of your choice, of course! And there's more hiking happiness coming your way! Every month throughout 2018 you'll have a chance to win an item related to hiking comfort and/or safety, just to keep the Hiking For Her Happiness flowing. Wait, how is this related to hiking happiness? It makes me happy to think of you being safe and happy on the trail! Oh, and also because HFH is celebrating the tenth anniversary of existence, so there's that. So please make it a habit to open up this newsletter for your monthly password. Sneak peak: The April 2018 giveaway is related to hydration, and will be announced on April 2nd. Make a mental note to check back and toss your name in the electronic hat for a chance to receive something both lovely and functional. On the HFH website every month you will find one unique product featured as a giveaway, with a chance to win it for your very own gear list. Sometimes the product has been reviewed, to give you a good idea of whether or not it's going to be useful for you on the trail. Through April 1st, 2018 a trail journal from TreeTribe is being featured. Deadline to enter is coming up fast: March 31, 2018 at 11:59 PST. April Fool’s Day will be avoided (lest you think a prank is being played), but a winner will be picked via random number generator on April 2nd and notified right away. As hikers, we have a lot of purchasing power. It makes sense to maximize every dollar spent, by partnering with merchants who in turn partner with organizations who really "get" hiking interests. Case in point: the partnership between the National Forest Foundation (along with U.S. Forest Service and local partners) and REI Co-op. Here's the "catch": you need to make purchases using the REI credit card. If you're already using one, know that REI is on its second year of channeling up to $1M into National Forests and Grasslands restoration efforts. That's a happy thought, isn't it! Hiking For Her turned 10 years old this year. The one who writes all that stuff you read on HFH, and in this newsletter? She’s accelerating toward her mid-60s (yes, time does go faster with age). Which means that I’ve been thinking long and hard about aging gracefully as a female hiker in a youth centered world (the gear ads, don’t get me started on those blatantly biased in every way gear ads). Just a few weeks ago I finally decided to move forward with the idea of hosting a community of midlife hikers. I invited some wise, amazingly generous women to act as charter members to shape and guide its formation. No kidding, these women are the real deal, and I can’t wait for you to meet them. While females under 40 are welcome to join the conversation, I feel it’s very important to know why the intentional focus of this community may not appeal to younger hikers. My apologies in advance if you feel slighted because you haven’t yet attained the benchmark of Fabulous Forty. Or worse yet, if you feel offended by the candor of the name. We’ve decided to embrace being 40+. We know – and are living proof – that there’s life after 40 on the hiking trail. Please consider joining our circle of trail sisters as we celebrate being stronger, smarter, safer hikers together. Happy trails to you as April approaches and the days either grow longer, or shorter, depending on your location on our amazing globe. Reply to this email to drop me a line with thoughts, suggestions, or just to say howdy. Howdy = happiness in my book!